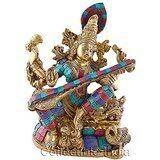 Beautiful Very Rare Solid Metal Brass and Inlay Stone Work on Body Hindu Goddess Saraswati in Sitting position. This is a beautifully crafted product which compliments your Home D cor. Measures about 10 Inches Height - Certified Quality - Heavy 4 KG weight. The name Saraswati came from saras (meaning flow ) and wati (meaning a woman ). So, Maa Saraswati is symbol of knowledge; its flow (or growth) is like a river and knowledge is supremely alluring, like a beautiful woman. -------------- Pls beware from Copy product & ensure buying authentic product. This is exclusive product of Brand " Collectible India" and "covered by intellectual property rights laws". 'Collectible India' do not authorize any other Brand/Seller to sell it and won't be responsible if any copy or substandard product send by any other seller.